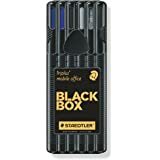 Sold by BLACKBLUE and Fulfilled by Amazon. Use xylene and toluene as ink ingredients. Dry safe ink increases product life span. Environmentally friendly manufacturing process. 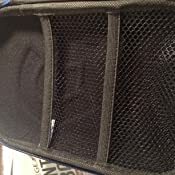 Reusable box, phthalate-free material. 0.8 tip gives line width of 0.3mm. Assorted colours. Packed: 10. Sold by BLACKBLUE and ships from Amazon Fulfillment. Sold by haicheng and ships from Amazon Fulfillment. My mom recently bought me these and I've waited a year to get them! 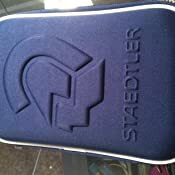 I bought the 10 with the zippered case. 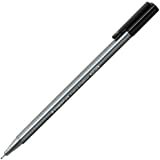 The pens write smoothly and have no skips. 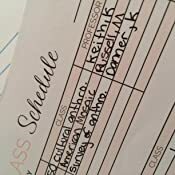 They do bleed a little bit through paper (I used my composition notebook to demonstrate) However when I tried them on my Bloom Daily Planner the pens barely ghosted on the back side (as demonstrated). The only complaint I have is the case. 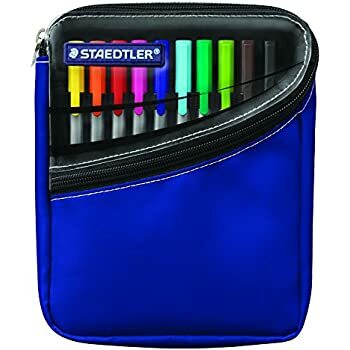 I regret buying because it because it's thin, and it's difficult to slide my Staedtler pens through. When I flipped to the other side it was difficult as well. It feels flimsy. 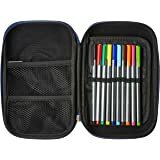 I would recommend just getting the pens without the case. Overall I'm very happy with my purchase! 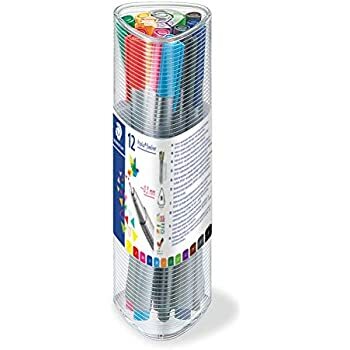 4.0 out of 5 starsGreat pens, not great color selection. 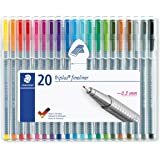 These pens are great for bullet journaling and any precision writing tasks that call for color. They have lasted much longer than other pens already, and still going strong. 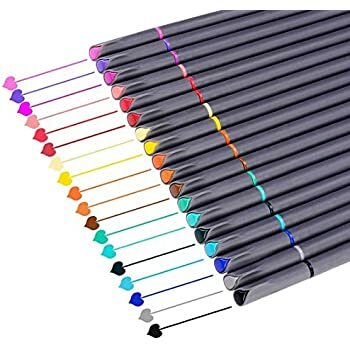 I gave four stars only because of the color selection, as one third of the pens are too light for most uses, and there is NO PURPLE PEN???!! 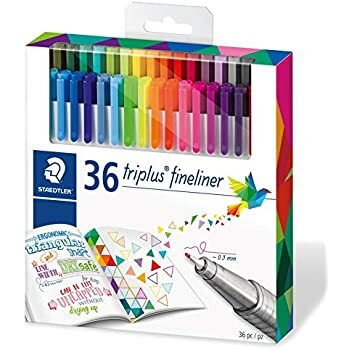 I really like writing with these pens, but I won't use them in my bullet journal like I planned because you can see every pen stroke on the other side of the paper. It doesn't bleed per say, but the shadow is dark enough that you would have to use only one side of each page. My journal is a Lechturm 1917 dotted. These pens are all I thought they would be! They are hot stuff in the planner world, so I couldn't wait to get a set for my newly acquired planner. I like the slim, triangular shape, which provides a pleasant grip. I also like that the caps click on well on both ends, and I don't have to worry about losing them. Mostly, I love the smooth, superior writing experience that these German-made beauties offer. They don't bleed through or shadow on my Plum Paper Planner pages. I've only had these for a day or two, and I've already decided I need another set with additional colors. I have been using these pens for about 3 months now. When I first got them they were great. Colors were vibrant, and the color selection was okay (yellow and brown were not very useful colors for me). I enjoyed the case as well. One part of the product that really stood out to me was the design of the barrel, I didnt expect much from the triangular design but it was very comfortable for long term use. I use the pens for underlining textbooks and writing notes. My main gripe with these are their longevity. I use the orange pen quite often, and it is quite noticeable. I've attached a picture comparison with the yellow pen that I rarely use. The color in the pens I use the most have definitely diminished since I first received the pens. The felt tip writes a bit scratchier than my sharpie extra fine points, so I deducted one star for that, but the colors are bold, and I simply love the convenience of the case. 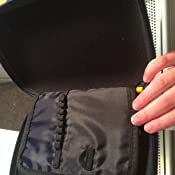 Makes it really easy to travel with (without worrying about a pen getting lost at the bottom of my bag), and I have to admit that my inner child just gets tickled at that little "click" sound it makes when you snap it in place to make it stand. 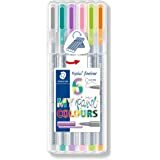 I was really nervous to buy these, because generally I find felt-tip pens really irritating and difficult to write with. They're always skipping, the flow seems inconsistent, and they're generally uncomfortable to write with. 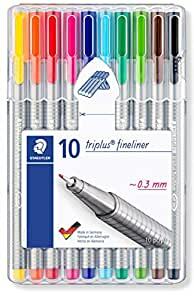 However, since these are the marker-pen of choice for bullet journalers, I took the leap. I am SO GLAD I did. These are everything a marker pen should be. 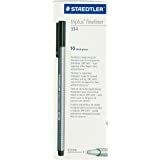 They're smooth, precise, and offer some of the feel of a marker while producing a thinner pen-like line. I am actually already regretting not springing for the larger pack! One thing to note, the barrel of these is kind of a triangular prism with rounded edges. That's awesome because they don't roll around when you sit them down, and to me they're comfortable to hold (sort of like those pencil grips you used to use in grade school), but it is different than what you might be used to. 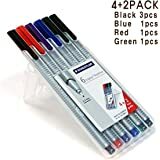 4.0 out of 5 starsGood pens. 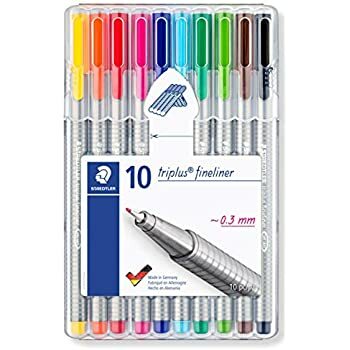 I bought these pens with the use of bullet journaling in mind. I like them quite a bit! The colors are nice and vibrant. The pink, teal and bright green are some of my favorites. My only complaint is with the black color, and it's a small complaint. If you go over it with highlighter, it tends to smear. So now if I know I will be using a highlighter I switch to my sharpie pen, which doesn't bleed.